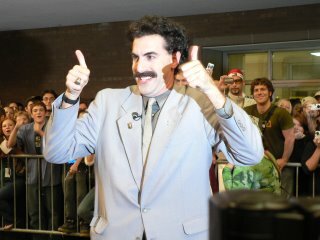 Hollywood pundits may focus on the buzz factor surrounding “Borat: Cultural Learnings of America for Make Benefit Glorious Nation of Kazakhstan,” the hilarious feature film based on British comic Sacha Baron Cohen’s (pictured above at the 2006 Toronto International Film Festival) popular character, Kazakh TV reporter Borat Sagdiyev. “Borat,” about the crazy Kazakh man’s travels throughout America and goal to meet his dream woman, Pamela Anderson, is a hit on the Internet. The key pundit question prior to the film’s opening today is whether these young “Borat” devotees will buy theater tickets in sizable numbers. Will “Borat” be the new “Jackass 2,” meaning a gross-out comedy hit? The more pessimistic possibility is that “Borat” will sink like another movie with tons of Internet buzz, a recent horror movie featuring Samuel. L. Jackson battling snakes on a plane. But what grabs my attention like Borat clad in a clownish swimsuit, an elongated thong that barely holds his privates in check, are critical reviews as enthusiastic as any Internet posting by Borat’s army of young fans. Not since past gross-out hits “American Pie” or “There’s Something About Mary” has a rowdy comedy appealed to young and old, the serious film buff and the college frat boy, high and unapologetic lowbrow followers of culture. It’s encouraging proof that when politically incorrect comedy is done well, and Cohen performs his improvisational bits with goofball perfection, the result is overwhelming, belly-aching laughter for all. Early excitement for the Darren Aronofsky fantasy film “The Fountain” is completely understandable. A time traveling adventure set in sixteenth-century Spain as well as a medical lab in the near future and the twenty-sixth century, “The Fountain” is Aronofsky’s first film since his mind-bending adaptation of Hubert Selby Jr.’s drug addict drama “Requiem for a Dream.” Aronofsky crated the sci-fi story with Ari Handel. Cameraman Matthew Libatique creates some amazing imagery. Rachel Weisz is the beauty behind the tasks, playing Spain’s Queen Isabel as well as a modern-day woman. Hugh Jackman is the conquistador, scientist and future traveler. To call “The Fountain” anything but a dizzy, mind-blowing catastrophe is to overlook the utter wackiness of the movie (more on that at a later date). What’s fascinating is that of the three Hugh Jackman movies this fall, “The Fountain,” the turn-of-the-century magician’s drama “The Prestige,” and the cartoon comedy “Flushed Away,” Jackman is at his best in the latest cartoon feature from the creators of Wallace and Gromit. As Roddy, a clumsy rodent trying to return to his comfortable London home after being swept down the toilet drain, Jackman shows the same lunacy and grinning verve he displayed as singer/songwriter Peter Allen in the Broadway musical “The Boy From Oz.” As a tuxedo-wearing mouse, more than a magician or a conquistador, Jackman reveals the best part of himself. He’s funny and one hopes he has the chance to be funny again, whether cartoon or in the flesh. The Fountain opens nationwide Nov. 22. The Prestige is currently playing theaters nationwide. 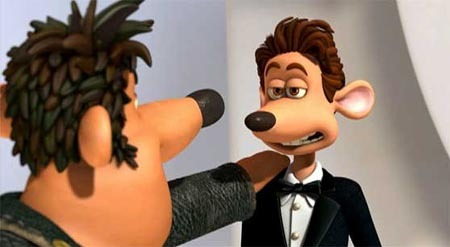 Flushed Away opens in theaters across America Nov. 4.